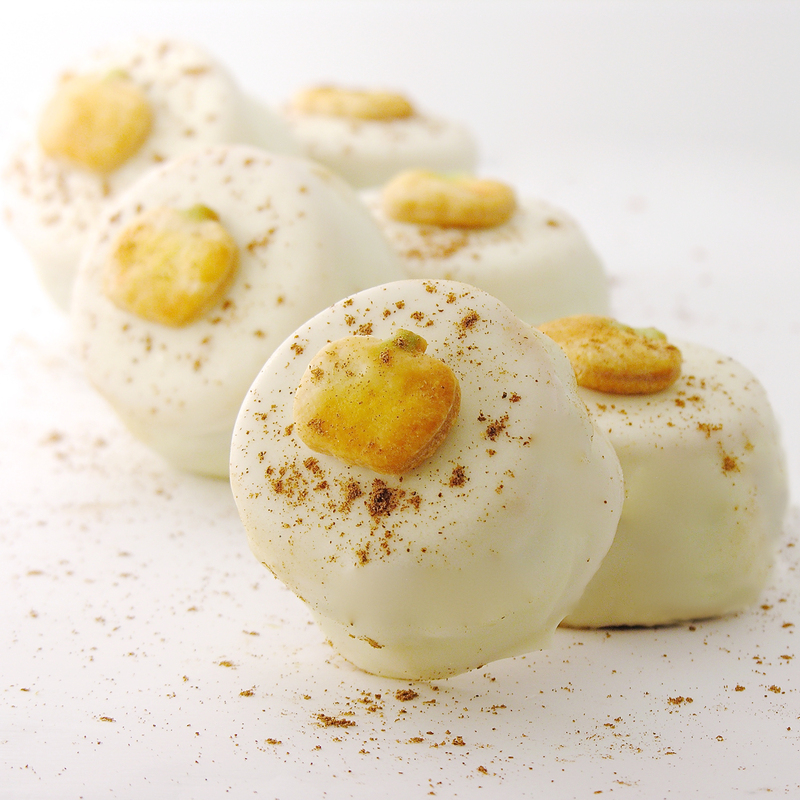 Why have plain old pumpkin pie, when you can have these Oreos- filled with pumpkin and dipped in white chocolate?!? Admission: I don’t like pumpkin pie. I never have and probably never will. I don’t like pumpkin spice anything either. The best way to ruin a Starbucks drink is to add pumpkin spice. Ew. So I made these for you. All of you lovers of pumpkin out there! I also distributed these to as many pumpkin-addicted friends as possible, to get their thoughts. They LOVED them. I like that they are cute. Cute is always good. Like that photo, pumpkin people??? 🙂 I bet you do…. 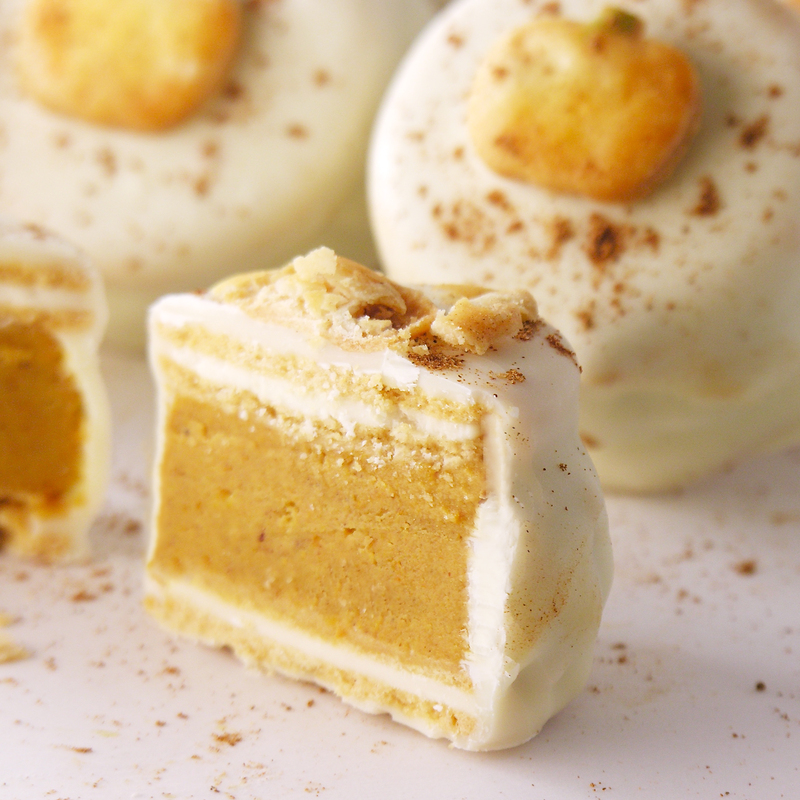 If you love pumpkin pie- you will go crazy over these fun little cookies! Place pumpkin, condensed milk, TWO eggs (save one), pumpkin spice, and salt into a medium mixing bowl and blend well using a whisk. Bake at 375 for 45-50 minutes- until a toothpick inserted into the center comes out clean. Remove from oven, spoon into a clean mixing bowl and blend until fairly smooth (it’s pumpkin, so it won’t be creamy smooth- but without big lumps). Freeze for 30 minutes- until chilled through. 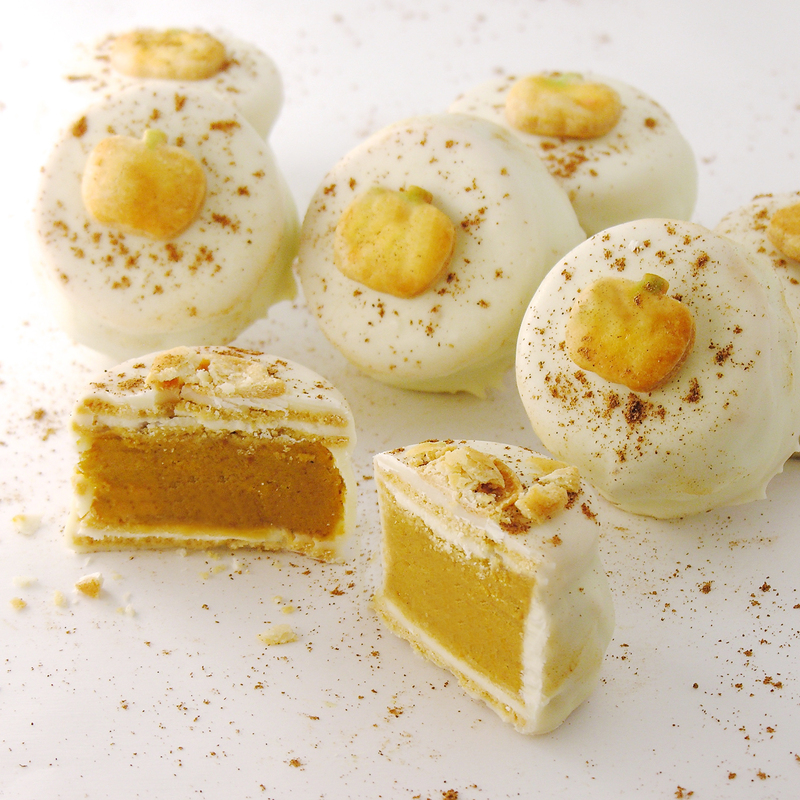 While baking /freezing pumpkin, make pie crust toppers. Unroll pie crust and use a small cookie cutter to cut shapes out. Place these on a parchment paper-covered cookie sheet. Bake at 375F for 7-8 minutes. Keep an eye on them! Mine got a little too brown. I just popped these in while my pumpkin was still baking. Cool on counter. Place 1/2 of Oreo Thins on a small cookie sheet. 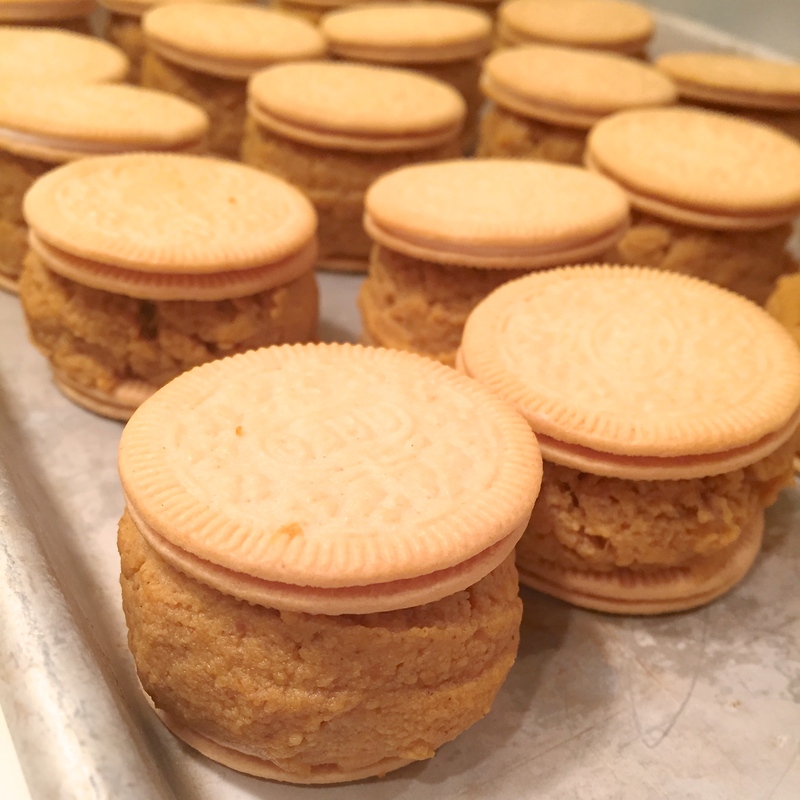 Scoop cooled pumpkin on top of each and gently press second Oreo on top. Freeze for at least 30 minutes (until pumpkin in the center is fairly hard). Melt Candy Melts in a bowl the microwave in 30 second increments, stirring until smooth. 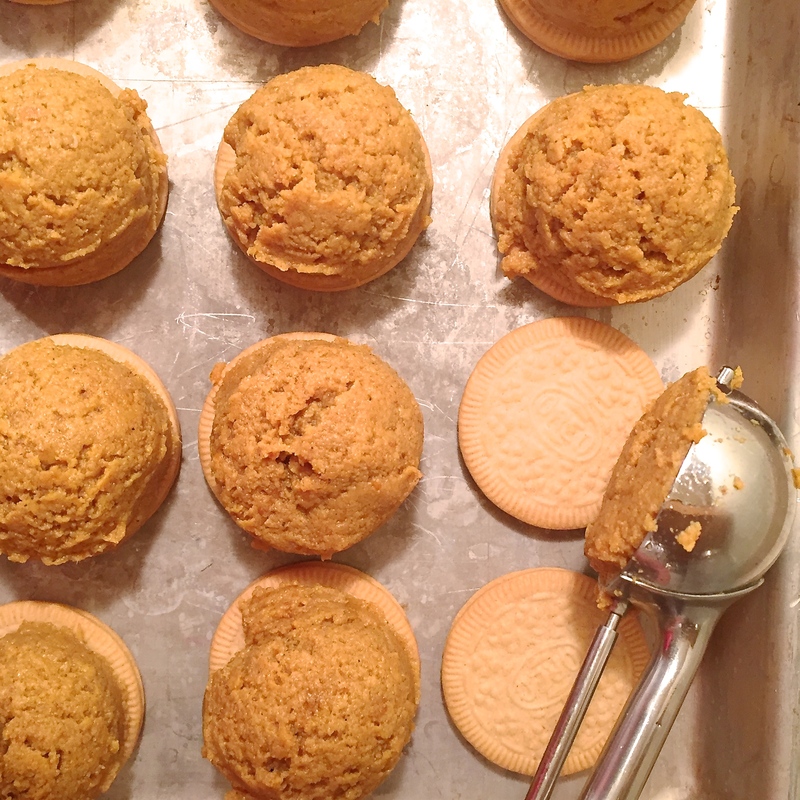 Set a pumpkin-stuffed Oreo into candy melts and spoon over the top and sides. Remove using a fork. Tap against edge of bowl to drain excess away and gently slide onto parchment paper. 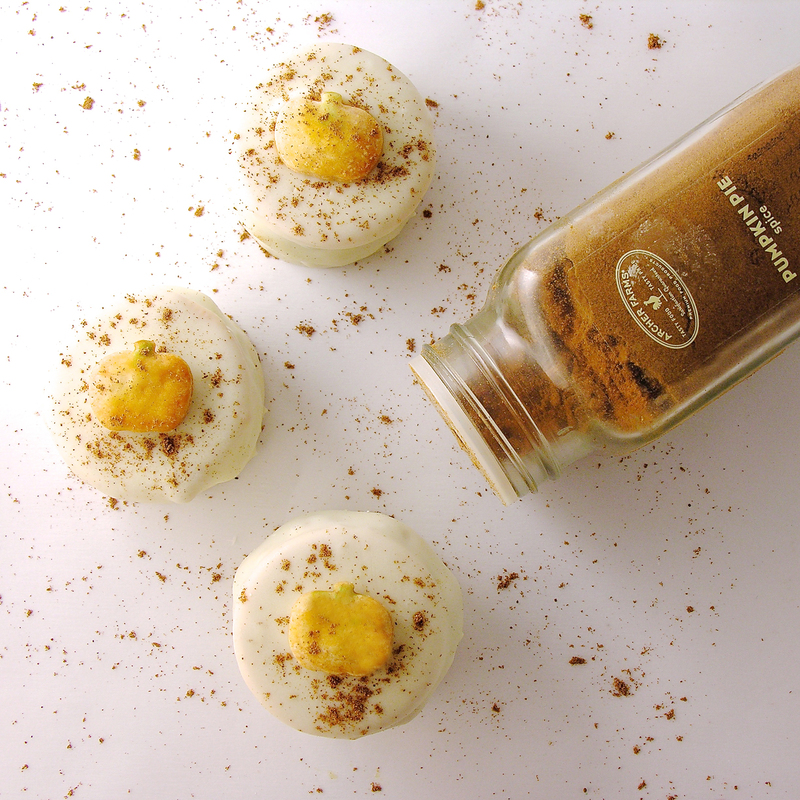 Before candy hardens, place a pie piece on top and sprinkle with a little pumpkin spice seasoning. Allow candy to fully harden ( a couple of hours). Serve in a pie plate- or bag them up in cute cello bags with ribbon. My thoughts: Honestly, these take a little time. You bake a pie and then turn it into cookies. Everyone loved the HUGE amount of pie filling in each cookie- but if you haven’t done much dipping in chocolate before, I highly recommend you get a second box of Oreo Thins and put less in between each cookie. The hardest part of this process was coating such a tall cookie in white chocolate. 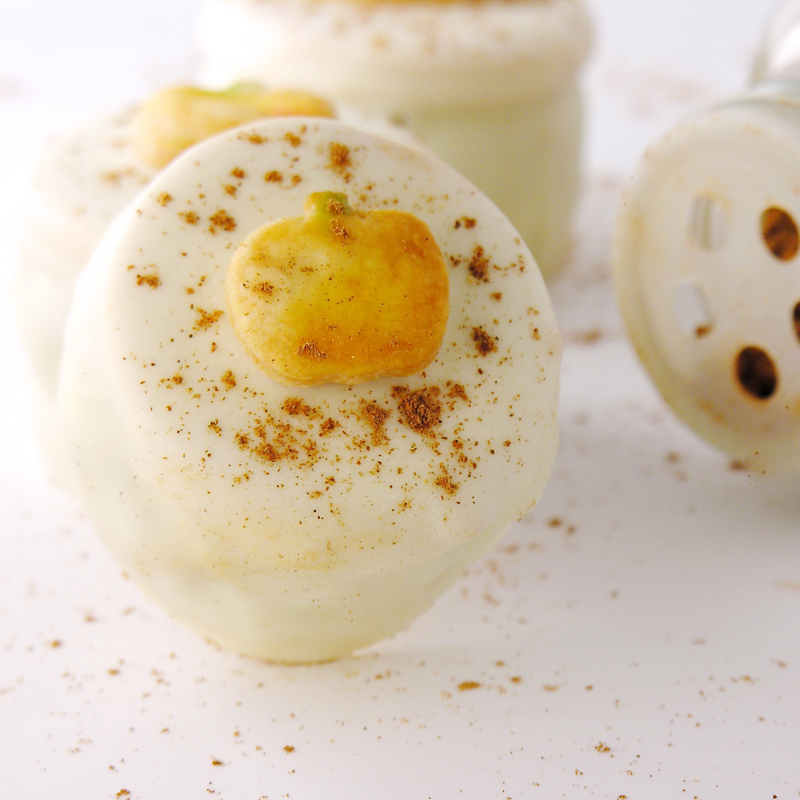 If I made these again I would use less pumpkin filling to make that easier. If you do this, you will need a second bag of candy melts as well. Posted in Cookies, Pies, Seasonal dessert and tagged chocolate covered pumpkin pie, dessert, fall dessert, fall recipe ideas, Oreo dessert, Oreo Thins, Oreos, pumpkin cookies, pumpkin dessert, pumpkin pie, pumpkin pie dessert, thanksgiving, thanksgiving dessert, thanksgiving dessert with oreos, white chocolate. Bookmark the permalink. Oh how I always adore your sweet treats Ruthanne!